So I've been home for exactly 38 days now and been back at school for 5 weeks, and it all seems like so long ago that I was away. It was hard getting back to reality. I'm finally getting my last blogs written, as well as all of the photos uploaded and with descriptions/comments. It's an incredibly long process since I'm such a perfectionist about it all, but I want it all perfect before I get the hard copy book printed. It took me 2 days and 5 flights to get home. I was pretty jet lagged for at least the first week back. I slept almost the entire next day after I got home, waking up when Brendon got home from work at 4pm. I was also pretty disorientated in my sleep for a couple of days, after having been sleeping in a new place at least every second night for the last month. I woke up at night and it took me ages to figure out where I was and who was lying next to me! I actually thought it was Tove instead of Brendon haha. I know it seemed like almost every day I had to mention/moan about how hot it was, how sore I was, and how little sleep I had had, but it really was a fantastic trip where I met some cool people and saw some amazing places and things. I did every single optional extra that was offered by Contiki, even the hard and scary ones, and had an awesome time doing them all! I didn't go out and get wasted every night, so I was able to enjoy myself every day and make the most of the time that I had in Europe. I managed to visit and do all but two things on my bucket list, and they were to see the Mona Lisa at the Louvre in Paris, and go clubbing in Monaco. Unfortunately we just didn't have enough time in Paris to see the Louvre at all, which I was a bit disappointed about, although missing out on clubbing in Monaco didn't bother me. We went to the James Bond casino instead. I did also miss out on going up the Eiffel Tower because of the rain, and again a bit of a disappointment, but at least I still got to see it and have some photos taken underneath it. On my taste test bucket list, I tried all but the brownie, although I did try a muffin instead. The entire trip seemed to go so fast, yet at the same time, so slow. In exactly one month away, I managed to survive some scary activities such as paragliding and white water rafting, ridiculous heat, doing A LOT of walking (I wasn't sure if I was going to come back lighter of heavier after the trip, but I think the amount of foreign food I tried was equalled out by the amount of walking we did, which was probably a lucky thing after all), a 25km uphill bike ride, pick pockets, foreign public transport, bed bugs, scabies, the Contiki cough, and a bus load of Australians who continually liked to mock mine and Stacey's accents! We had accent arguments the entire time, and to them I am now known as 'Kindle' or 'Kiwi'. The 'Contiki cough' (yes it even has its own name) spread through the bus like wildfire, but amazingly Stacey and I managed to dodge it. So it seemed that participating in those Nana activities such as going to bed early and not drinking much, really paid off. By the end of the trip, I had to put my headphones in on the bus to avoid gagging as I heard everyone else coughing constantly! We also had a very severe case of bedbugs and scabies which led to one girl having to leave Contiki and go home to Australia. In hindsight (after realising where the bedbugs had come from), Stacey and I realised that the place we stayed in, in Rome, had bedbugs crawling over the beds. We saw bugs at the time, but swept them off the bed assuming they were just sand flies or something, not realising at all that they were bedbugs. Amazingly we managed to avoid these little critters too! Since we stayed there, the entire campsite has been fumigated and other tours managed to get hotel upgrades to compensate. I was also proud of the fact that I managed to avoid ever needing to use the coach toilet the entire trip! Knowing me and my bladder, I thought this was going to be quite a challenge on day one when they asked us to only use it if really necessary, however I managed. Yay! It did help that the coach stops every 2-3 hours though. I managed to take almost 1800 photos over the month, and I finally got my 'letter' photos completed in Sweden, just in time. I spelt out the phrase 'there's no place like home' in over 11 different countries with the help of Stacey and Tove. I can't wait to get on to scrapbooking all of these photos, and getting my blog entries and photos printed as a hard cover book. I did manage to carry Swampy the Pukeko all over the world with me, but he never really left my bag. I decided that it was too much effort, and he was too big, to carry around in my handbag every day, just for the odd photo opportunity. 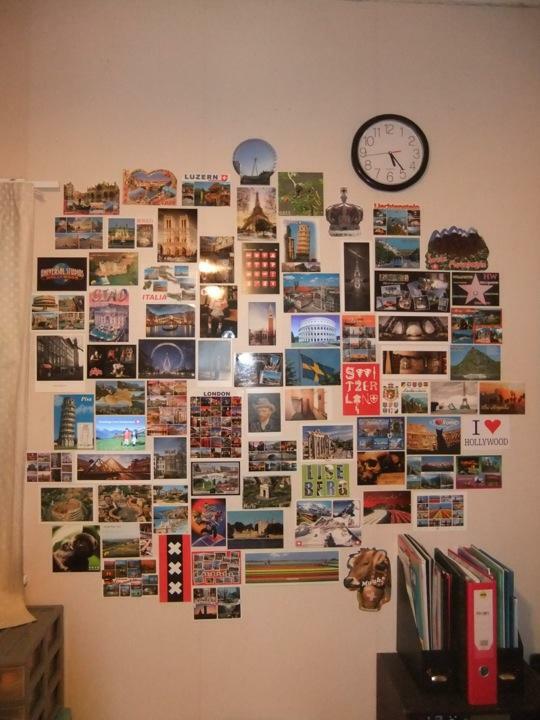 In each country and city I went to, I tried to buy at least one postcard (but most often, several from each), and I've made a postcard collage on the spare room wall. I was also very excited to do this and I reckon it looks awesome. Now whenever I walk down the hallway, I'm reminded of this amazing adventure. I'm so glad I bought the iPad before this trip, as it was just the best item I had while I was away. It allowed me to easily keep up with writing my blogs and updating photos throughout the entire trip, it allowed easy access to the internet, I could listen to all my music on it, I could read my book from it, and it allowed me to back up all of my photos each night, in case something happened to my camera. It was definitely a worthwhile purchase!